Of course we love Christmas. We know our furry friends do as well. They may not be able to say it but you can see it in their excitement in their eyes and waggy tails. So let them express it even more with one of these awesome I "Heart" Christmas dog sweaters. 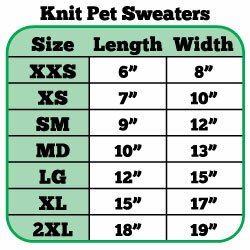 Your dog will look super adorable and we know you can already picture this sweater on your furry friend. We sure can! So jump on this while supplies last! Purchase the Mirage I Heart Christmas Knit Dog Sweater Now!